I used to live with a true Thanksgiving cat. Thanksgiving was OC’s favorite day of the year, and she would spend all of it sitting in front of the oven waiting for the turkey to cook. After her day-long vigil, we figured she’d earned the first bite. And then she got her own plate of turkey to eat while the rest of us were wasting time with things like mashed potatoes, stuffing and veggies. Not all cats are as patient and dedicated as OC was, but most will enjoy joining your Thanksgiving celebration, even if their menu has to be slightly different from yours. While you’re carving the turkey, put some of the meat on dishes for the cats. They’ll be too busy eating to pester you while you’re preparing the humans’ food. Turkey, torn into chewable pieces, but not cut into teeny bites. Cats enjoy tearing meat with their teeth. Sweet potatoes. They’re good for cats! Some dry cat food manufacturers use sweet potato as the starch that holds the pieces of kibble together. Cooked pumpkin. 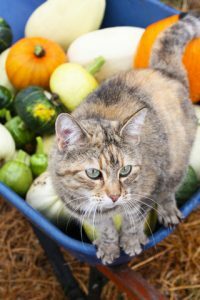 Pumpkin is also good for cats and is often used to relieve stomach upset. Whipped cream or vanilla ice cream. Most cats love both whipped cream and ice cream. Or give your cat a saucer of cream before it’s whipped. Chocolate, alcohol and onions are all toxic to cats and can be fatal. Be sure to serve your cats’ turkey without the gravy! Cooked turkey bones are also dangerous. They can splinter and lodge in your cat’s throat or puncture internal organs. If your cat is very shy, give him a quiet place where he can enjoy Thanksgiving dinner in peace. A houseful of noisy people can be very traumatic to a shy cat, and your cat will probably appreciate being able to spend the holiday behind a closed door in his own room. Spend some time in the room with him before your guests arrive. And don’t forget to tell him his friendship is one of the blessings you’re most grateful for this Thanksgiving!